Ethan is very nice! The pictures that you have taken of him look great! It looks great how you have captured in the photos his facial expressions! He has very nice eyes. @Rosemow, thanks! 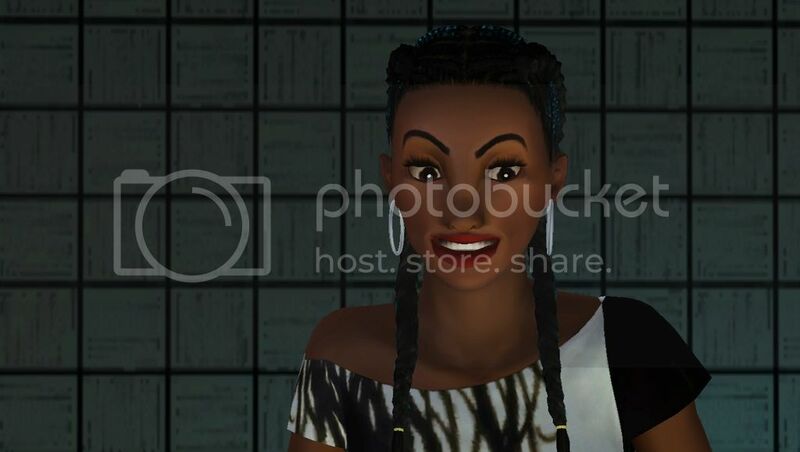 I love capturing the expressions of my sims. I'm surprised I got such a good shot of Ethan showing that funny video, since he was standing right next to this girl. That hardly ever happens, unfortunately, but at least I got it. He looks cute, if I do say so myself. I found your thread from your signature and lurked it but I haven't had much of a chance to leave a comment. 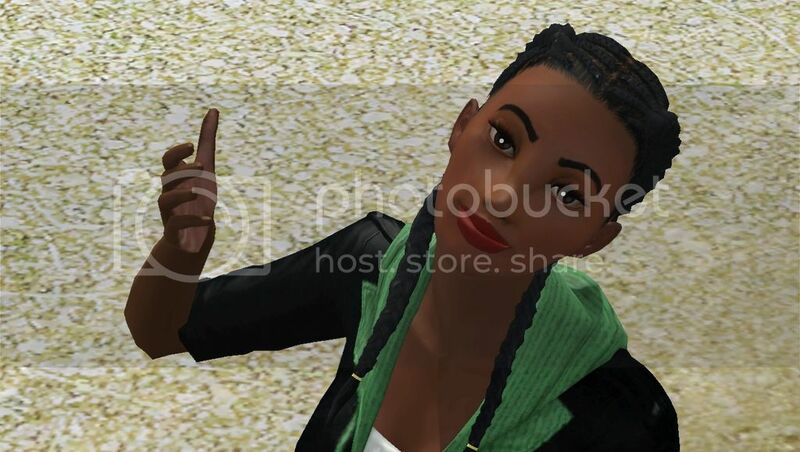 You have such interesting sims, and you've really taken a lot of effort to showcase their personality in their write ups, I love it! One of them reminds me of Lillian Gish, so adorable. I really like the industrial steampunk sims pictures, it's great to see them in action. 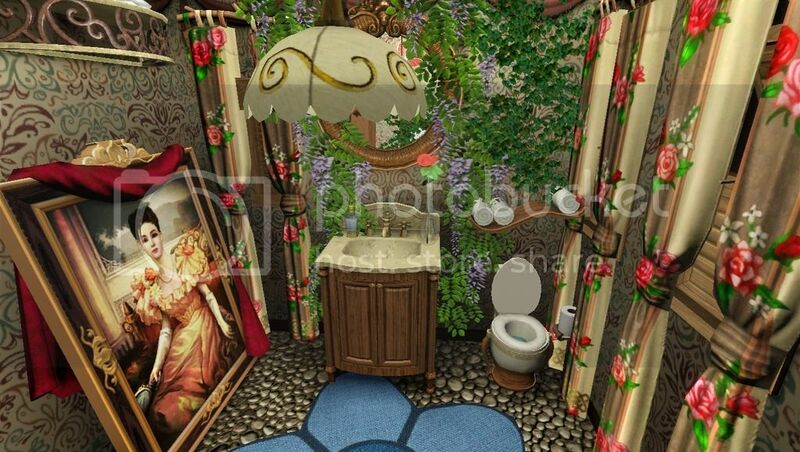 It really captures the disconnect of steampunk that appeals to me, seeing sims juxtaposing prim and proper with rugged and industrial. 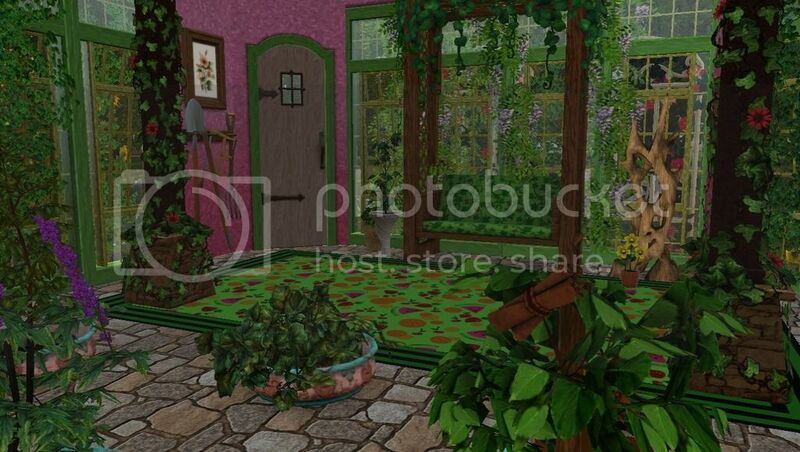 I love the entryway in the fairy tree house, and the CASting in the kitchen is just adorable it really looks cheerful and lived in. 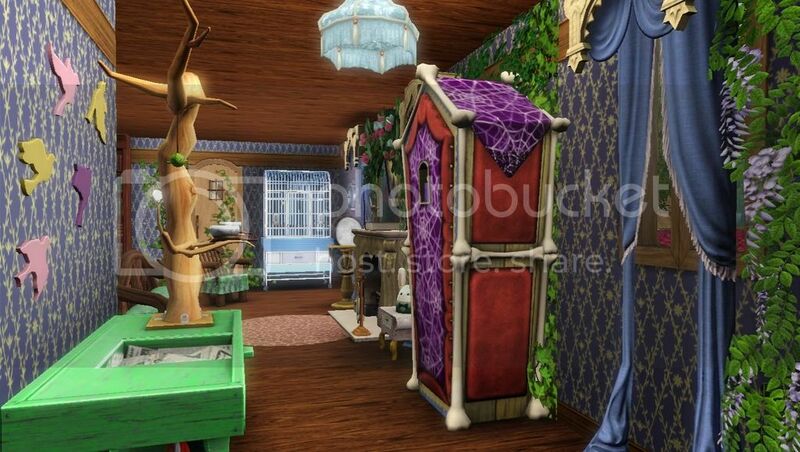 The woodlands diner looks so fun, I've never found much use for most of those items beyond putting them in Hidden Springs, It's great to see them come together in such a fanciful build. 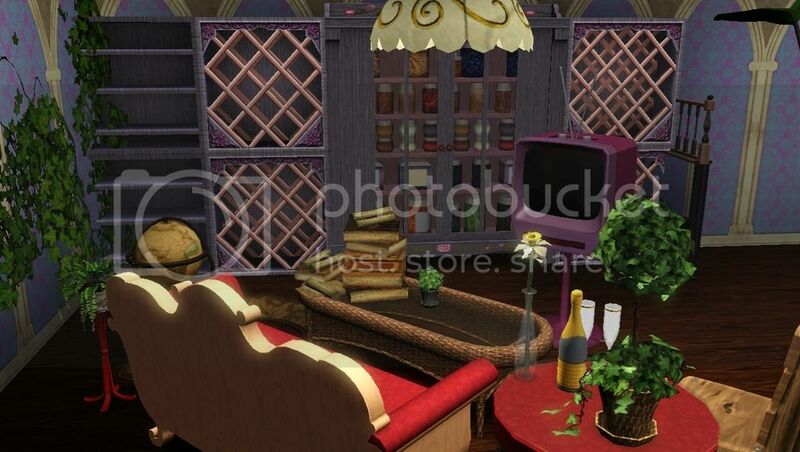 The dorm makeover looks really fitting, I always move my sims to Malan hall too. The hallway looks much better without all those stairs in the way, and I love the little casino area that's so unexpected in a dorm. The castle amusement lot looks Amazing! Both those castle pieces and the roller coaster track are such bears to work with and it looks great so far, I'm impressed! I'm going to favorite that one for the next time I am in a suitable world for it. 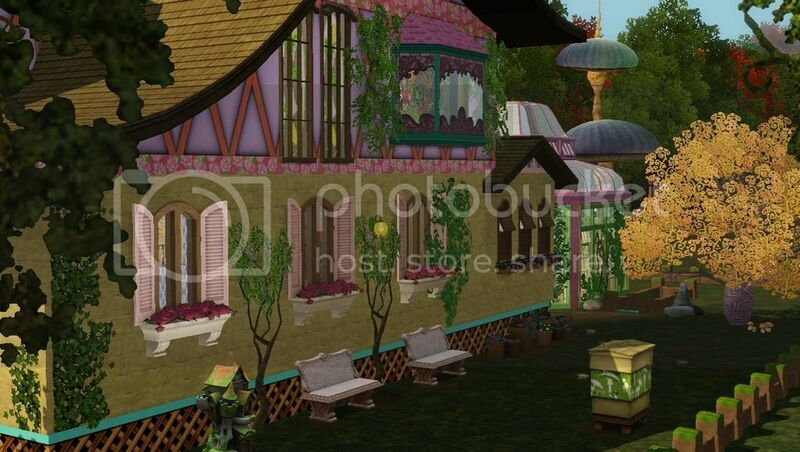 The steampunk farm is absolutely my favorite, just a showcase of creativity. Thank you for sharing your creations, I'm glad you decided to make a thread. It takes looking at larger pictures together to really appreciate builds. Those little upload previews don't really do them justice. I think that's why I like lurking creative and contest threads. Thank you so much @Jessabeans. 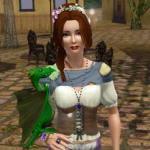 I try to do my best with sims (sometimes those i upload do need even more tweaking that i don't notice till afterward. ). I love capturing close ups of them in action. 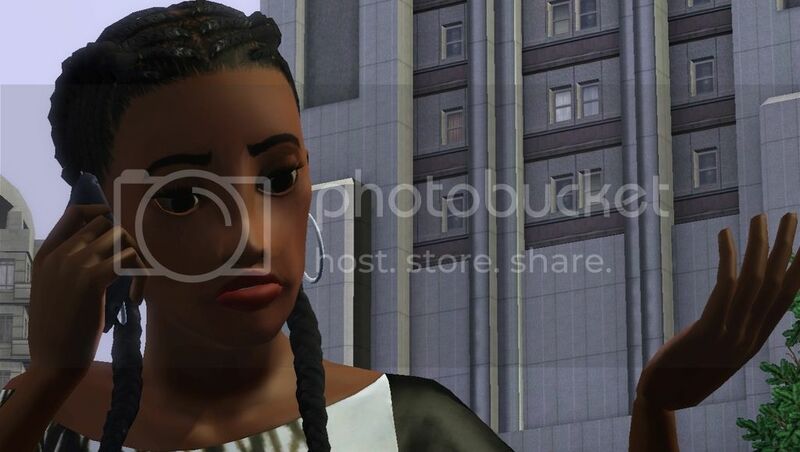 I find expressions in game and in real life very interesting. The treehouse one, for me, was something i hadn't done before. I love the way it looks from the outside. However, after playing it for a little while, i did have some routing errors, but only on the outside of the house where the plants are. The bridge didnt work properly either. I think some of it can be chocked up to the location i put the build. Sims have to run to the back of the house and up the hill to get to the street. Maybe, in another location, the plants would be fine where they are, but i never tested it. I just deleted the bridge and deleted some of the plants by the fairy house and still play the save to this day. Yeah, the woodland eatery was fun to build. I just love my store content. I find the different themes they have available so unique and different from the stuff from eps and sps. I also think they were more thought out and detailed overall, so most of my builds and even some of my sims have a lot of this content. 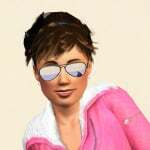 Yes, malan hall needed an update for university sims. Ick. Industrial seemed fitting and i love that look. The amusement park was probably my favorite to build. 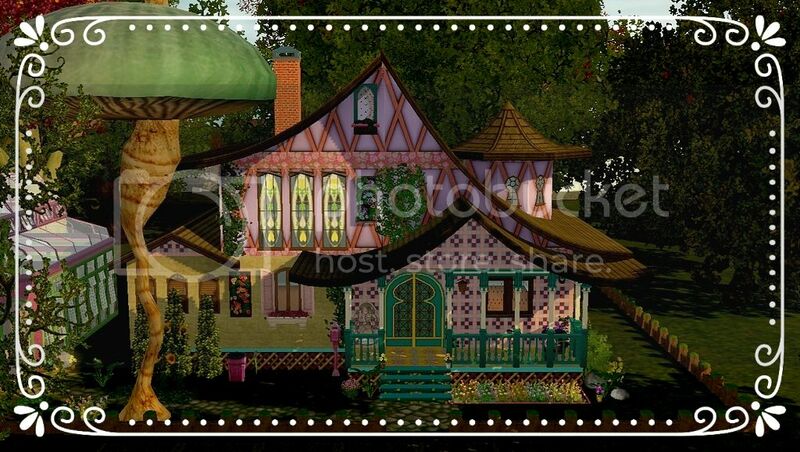 It didnt take too long unlike my steampunk farmhouse and i enjoyed working with these new pieces. Well, that and the landscape. The least fun part about it was the interior of the bathrooms and the castle. I didnt know what to do, really, because i like realism in my games and it was built in dragon Valley, so... i was a little lost what to do there. My favorite is the steampunk farmhouse, too. I've never tackled such a big project before. I feared i wouldn't figure something out with the outdoors, since there was so much land to fill, but i think it looks pretty nice. I agree! I love seeing the creative builds people come up with. It's just a shame the exchange wasn't better in regards to pictures because most people don't use uic or was nervous about using an outside program, like myself. Thank goodness for this forum, right? 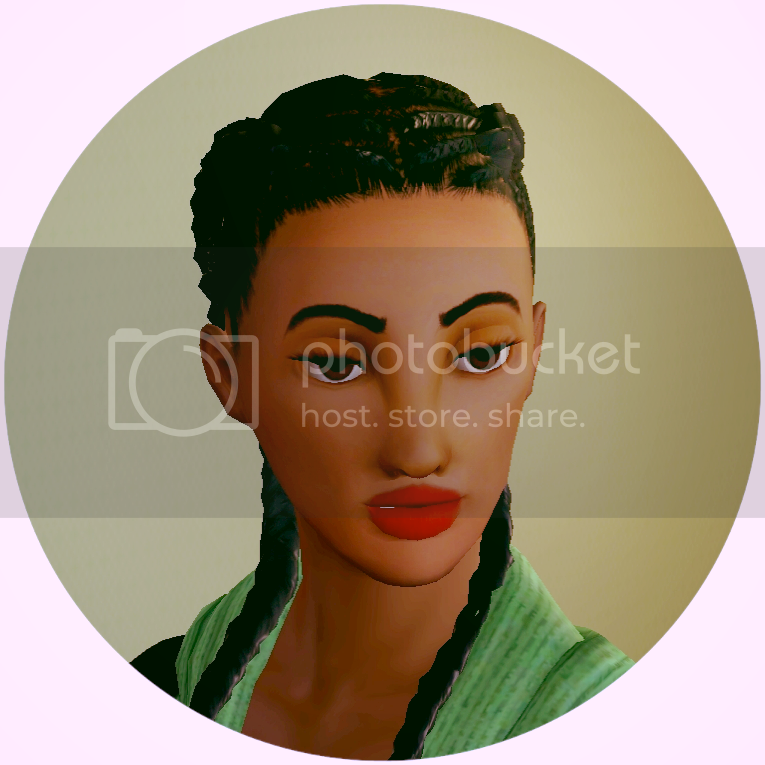 Just making a small little update, here, with a new sim named Jade Wiggins. Jade is very pretty! She has very expressive eyes! The photos that you have taken of her look very nice. She has very nice hair! Hee! Thanks, @rosemow! I really, really, wanted to use that hair very badly. I'm glad it fits her face because not everything does. So, it was down to that or the hair that looks like it's wrapped into a nice, big bow, from the store... but you can see what I ultimately went with. 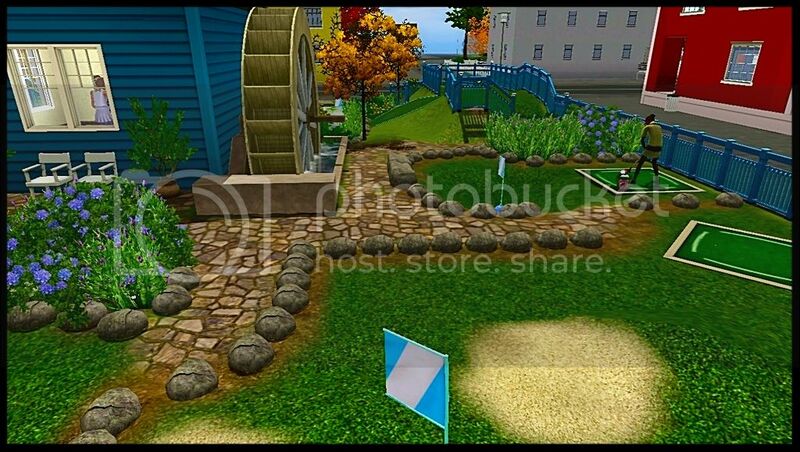 After I got back from a mini vacation, I had an idea to try a miniature golf course. I've been working on it ALL day, today. I needed even more patience than usual, since I really wanted to mess around with the elevation controls. I even tried a simple trick to make the main building look a bit better than average. This is the front view. I made an arched bridge and a nice looking pond. Added some rocks on the side, so I could make a waterfall as well and topped it off with a (rare) fish spawner. Inside the building is a foosball table for sims to play with, two all-in-one-bathrooms, and the ticket machine for barrier to entry system, which is across the bridge in this photo. I didn't have a set design and really just made everything up as I went. 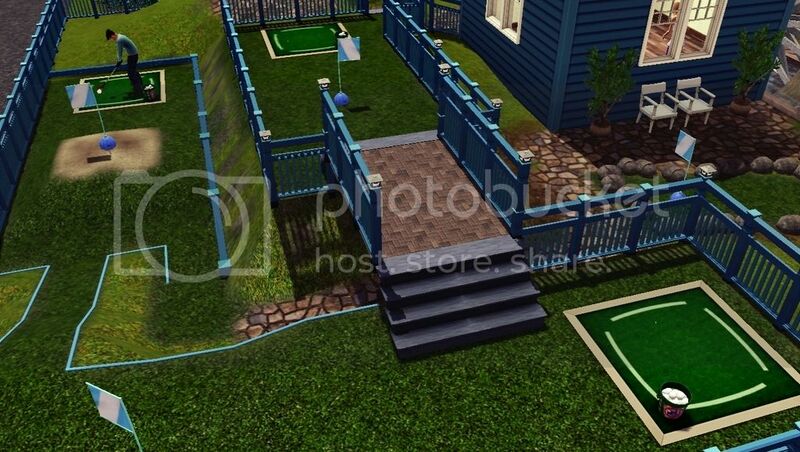 As I said before, I played with the elevation to make each hole unique and fun for sims to enjoy. I was originally looking for some other flag, but I stumbled across the buoys from Island Paradise in buydeug. I thought that would be perfect and never looked back. 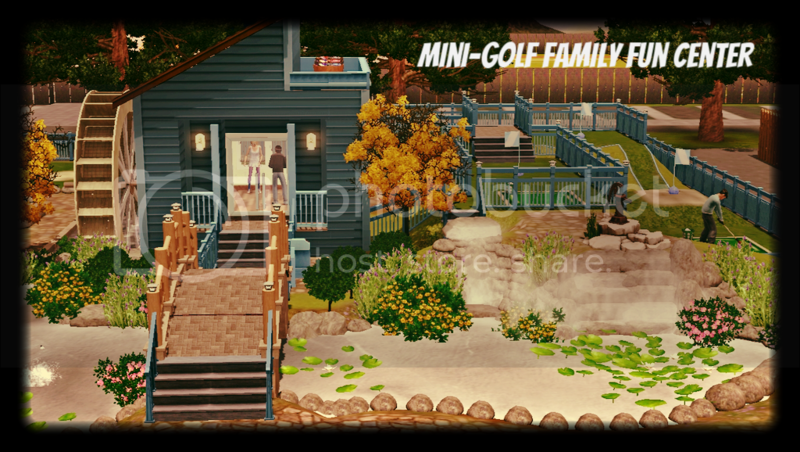 Mini-Golf Family Fun Center looks great ! You are so very creative! The layout of the build looks so very great! It looks great how you have used the buoys as the flags! The design of the.7 holes looks very nice. You have set up a great golf course! The sand banks are a great touch. The lilypad pond and the arched bridge looks pretty! The rocks look nice lining the edges of the water and the pathways. Sims will have fun playing foosball in the building. The water wheel looks great in the build! 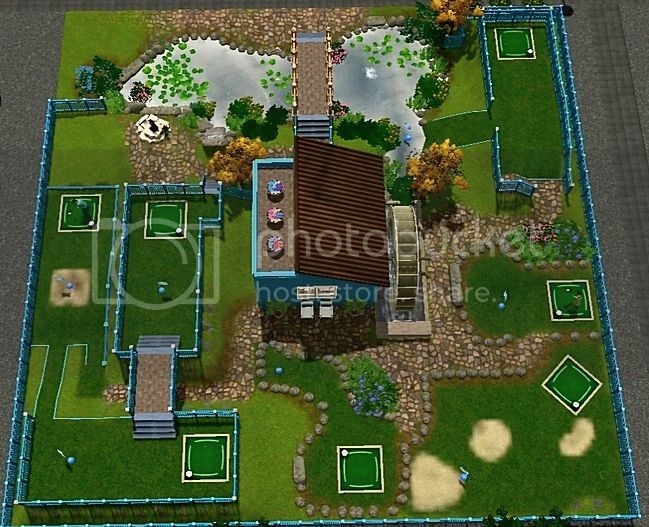 Sims will have fun playing golf there ! So, the other day I was waiting for my mom to get out of surgery and found myself looking through some home style magazines. I was inspired and motivated again to get back to my game, after a few months of absence. Lucky for me, I'm off till Sunday. What I intended to do was start a kind of modern build (not too modern as that's not my taste at all) to go along with the style I saw in one of the pages of this magazine. 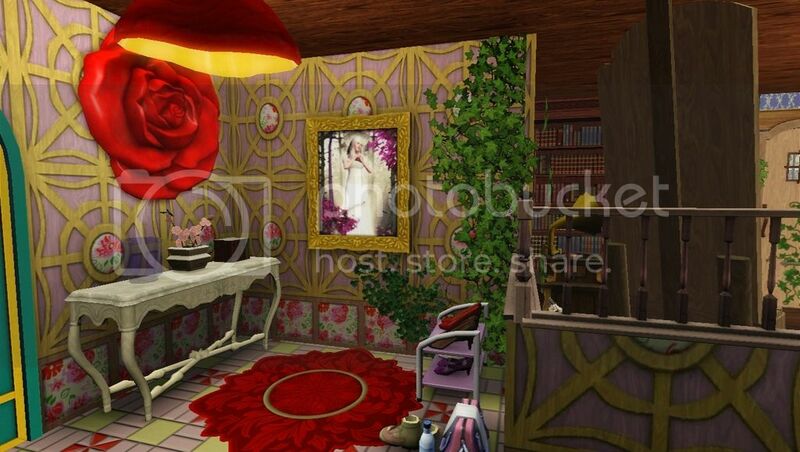 The idea was that each room had a bold color along the walls, but the middle would dress it up with different colors. The problem is that the structure of builds is my weak spot. I can landscape and decorate pretty well, I think, but when it comes to the general flow of the home especially concerning roofs? Big no no. So, I figure my best option is to look for pictures that will get my imagination going and hopefully the game will allow my plans to go forward... So, I wake up around 7 today and begin right away, work on maneuvering roofs for five or six hours and scrap the whole thing and begin again, but this time WITHOUT thinking of the whole room idea. I'll continue working on a roof idea, since I'm (FINALLY!) pretty close to figuring out a general look. Well, my persistence paid off because this is the first build I've made where I'm 100% satisfied with the look of the building itself. I'm so proud of myself. The roof actually looks pretty darn good and it appears as though I've advanced my skills... Who am I kidding? Roofs are difficult for even the most skilled builders. It just takes a little lot of patience! Well, that's obviously still a work in progress. I have not even started the inside and I'll probably still add a bunch of stuff to the outside, even though the lot is worth a fortune already. Haha. But oh well. I don't even pay attention to the price of my builds. I just want them to be the best they can be without the restrictions. The exterior design of your home looks so very nice! The curved/pagoda style roofing looks very great! Very nice tower on the roof! The various wall textures give a very nice look to the home. 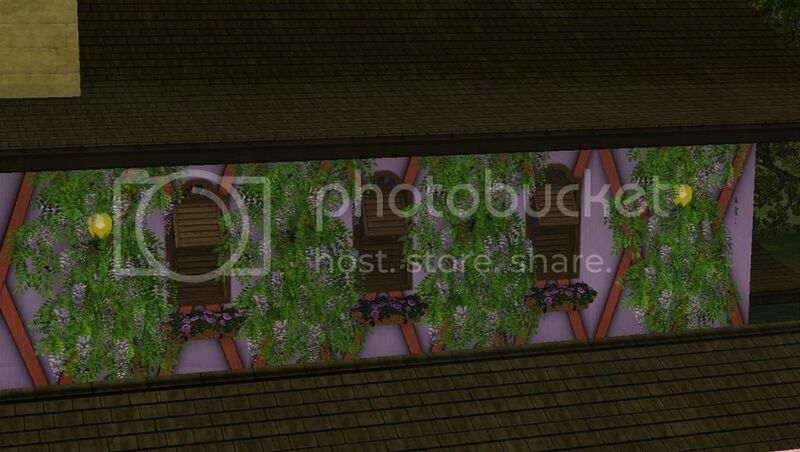 The stained glass type windows look very nice in the build, and the greenery is a nice touch on the walls. The front porch looks nice. The large alien plant looks great in the build! It looks nice the type of door that you have used. The WIP is looking very great! She's doing a bit better. She had surgery on her shoulder/arm area. 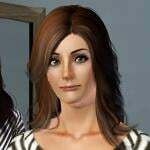 One night she tripped over a water spigot and went flying across the street and her arm has been hurting ever since. She was told it would only get worse unless she got surgery, so her appointment was a couple days ago. We just removed some of her bandages but she'll have to keep her arm in the sling for a few more weeks. In the meantime, she'll be having physical therapy and I'll be around to help her out. I am so sorry to hear that your Mother has the fall! It would have shaken her up. I hope that the healing process of her arm/shoulder continues to go as smoothly as possible and that the physical therapy will help her to regain strength and use back very soon. That is the most interesting roof I've ever seen! Thanks, @ciane! I've seen so many fun roof designs, but they all look so complicated. I think I made a good start on learning how to do it, but every build calls for something different, so it will be tough. Argh. I have always wanted to use those roofs but have never done anything I liked with them. I think yours is awesome! That's a VERY interesting roof! It really intrigues me, and I find it very attractive. Maybe I'm weird, but I like unusual builds. I absolutely LOVE your steampunk one, although I haven't put it in a game yet. I would imagine that the roof makes the tower unusable, but that's OK, you'd have to figure it's there for aesthetic purposes. The whole style reminds me of Dr. Seuss. I can't wait until you finish it. The pagoda roofs are very difficult to work with. They tend to overhang further than other roofs, so unless you want that kind of roof look, you have to start a square in. When you do that, you need to first cover the roof with flooring, so snow and rain doesn't get inside the house, because the roof won't cover it completely otherwise. In her case, she's going for a very whimsical look, so the far-stretched roof is right for it. If you reverse the pagoda curve, things can get even more complicated. Those are very good for fantasy kinds of builds. I've used them a few times, but the reverse curve doesn't look right on most builds. @luvalphvle, thank you. This is only my first try. Thanks, @MiaSkywalker! It's nice to know an expert on this style approves of what I've come up with. It's only my first try at this style, but it's been fun and I'm going to try to do more, since I love the cottage look. I've just stayed away from them so long because roofs are so hard and this style always looked the hardest. I absolutely LOVE your steampunk one, although I haven't put it in a game yet. That's my favorite, too. I don't know if you know of @HollownessDevour, but she was the person who really introduced me to that look. She has great things in her studio and I'm pretty sure they're all CC-Free. I think my favorite is her "Steampunk on a Stick." I really like how she incorporated the castle roof tops into that build. I've wanted to try doing something similar, but I'm also trying to get a hang of the roof thing, first. That's correct. I just put it there for looks, but, darn, would it have been nice for some extra room. *snaps fingers* Rats! I've been working on the inside. Like the outside, it's all very colorful. I'm trying to make it all flow without being a sight for sore eyes. I don't want to blind anyone. LOL. So, there's quite a bit of patterns, but nothing that will tear your eyes away from the computer screen. I especially like going into game for a little bit of testing. I've been playing with the light settings. 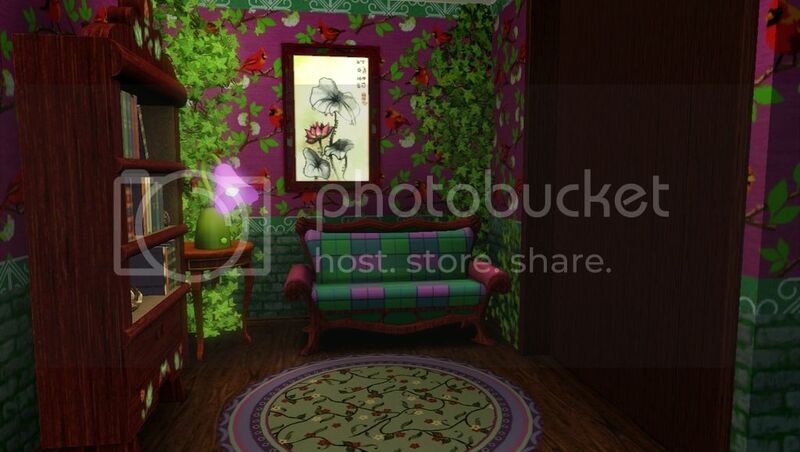 The outside looks really nice with magenta and the living room really glows with cyan. The pagoda roofs are very difficult to work with. They tend to overhang further than other roofs, so unless you want that kind of roof look, you have to start a square in. before I gave up. I connected a half gable roof to the pagoda, but since the pagoda roof stuck out more, I then added an extra half gable roof to the outside and deleted the walls around it, so they would be even, too. I managed to get that look right, but I was lost on what to do for the rest of the roof. Oh my, that IS an interesting looking house! That roof looks so COOL, but I wouldn't have any idea how to do it. I think you got as close as anyone is going to be able to. I would never have thought of doing it at all the way you did it, which is one reason I'm so intrigued. That house is SO fantasy. Your inspiration house has a chimney casing. I don't think I've ever seen one of those outside a Sims game. I've seen a few builds by Hollowness Devour. 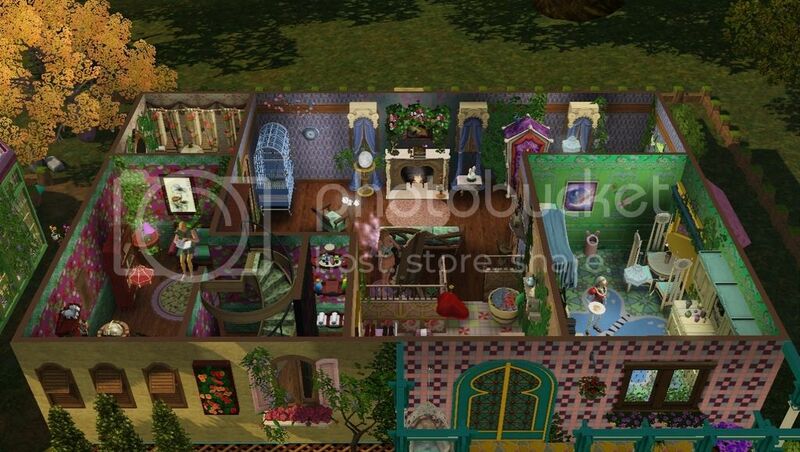 In fact, I fell totally in love with her Chateau Dauphin, and use it as my current Sim's France vacation home. It's a bit much for a single Sim, but it's so gorgeous I couldn't resist. I'm not sure that I've ever used any of her steampunk builds. When I play a medieval game, I sometimes put a single steampunk build in the world, for that crazy inventor that inevitably exists. I don't use steampunk a lot, though. I've been getting into steampunk lately in some of the books I've been reading, so I'm almost thinking I might play an entire game based on a steampunk theme at some point. 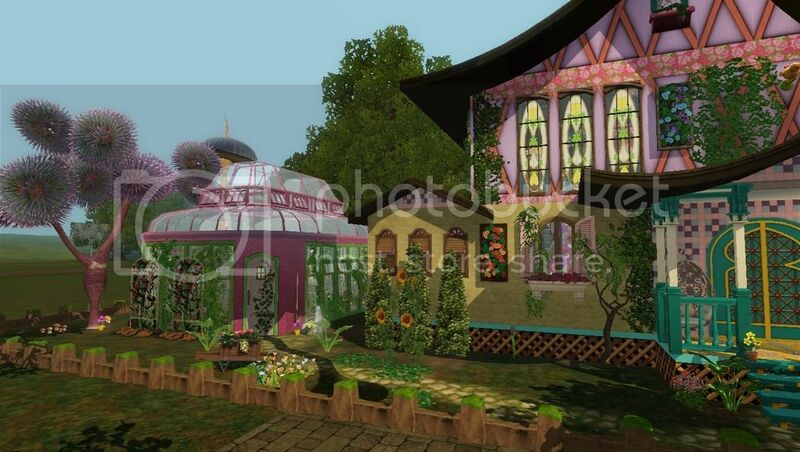 I just realized you have a tiny greenhouse off to the side of your fantasy house. I LOVE using those roof pieces, and often try to come up with an excuse to put them into almost any build I make. 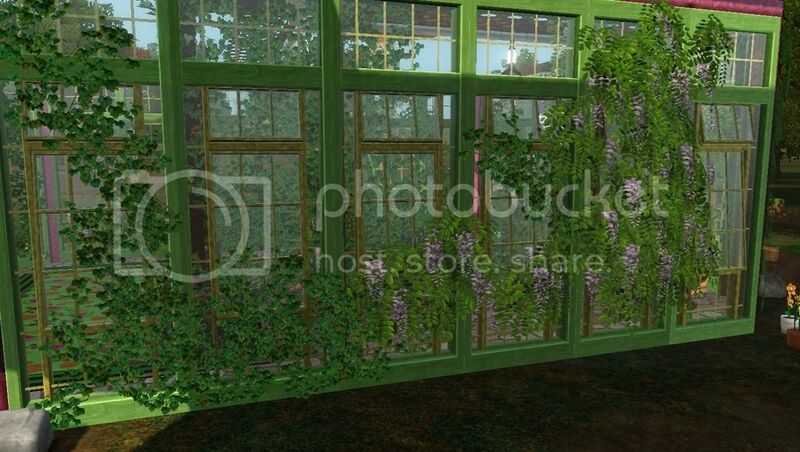 I removed all but two of these plants, so you can make the greenhouse your own. This crystal plant is the result of a spawner I placed on the lot, so it won't be there, when you start the game. You've really made it feel like their home is truly organic, something growing inside of a living tree. 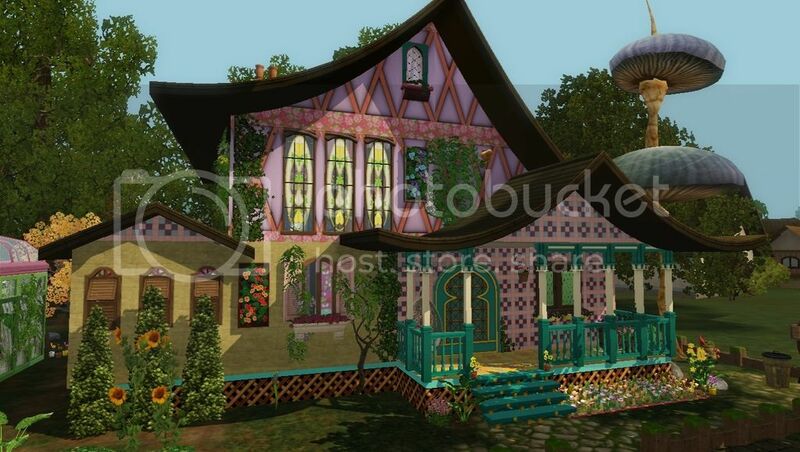 Sprinkle O Stardust is such a very whimsically pretty home! 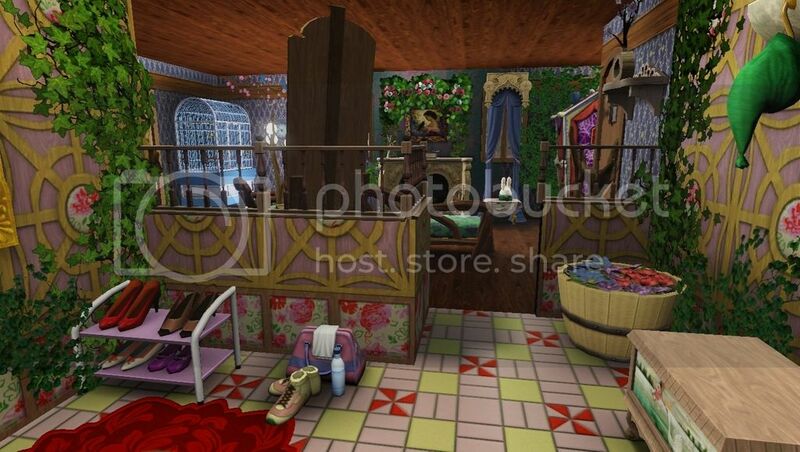 Both the exterior of the home and the furnishing of the interior looks so very nice! 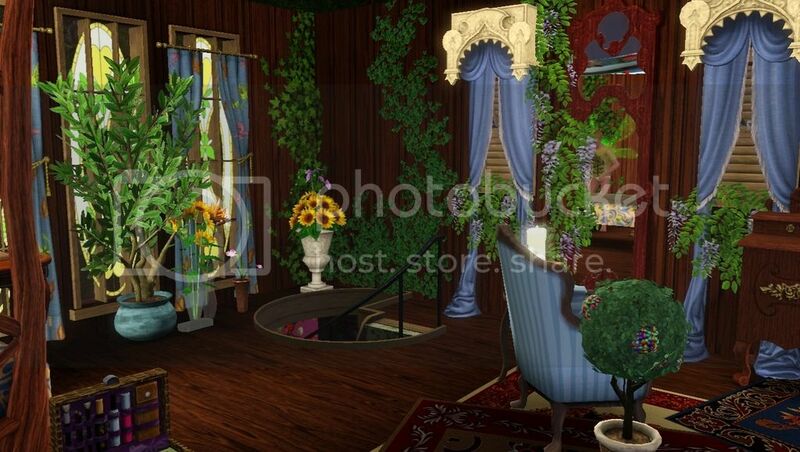 The greenery and flowers through the interior rooms looks so very nice! 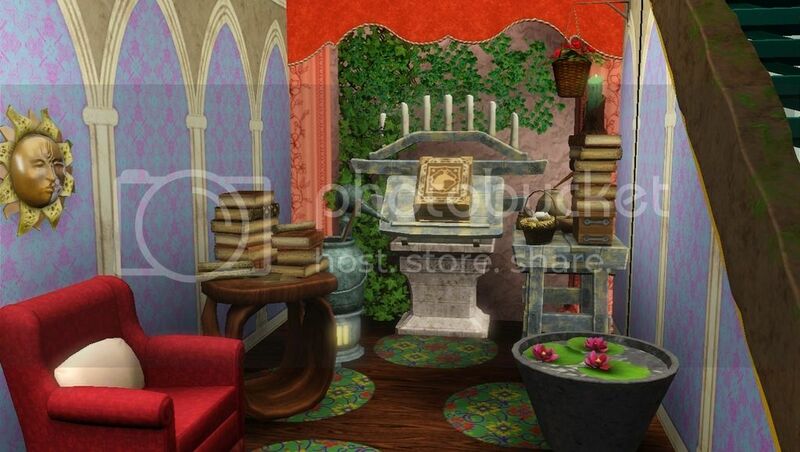 Very nice colours, textures and patterns that you have used for the walls, flooring and furnishing items ! 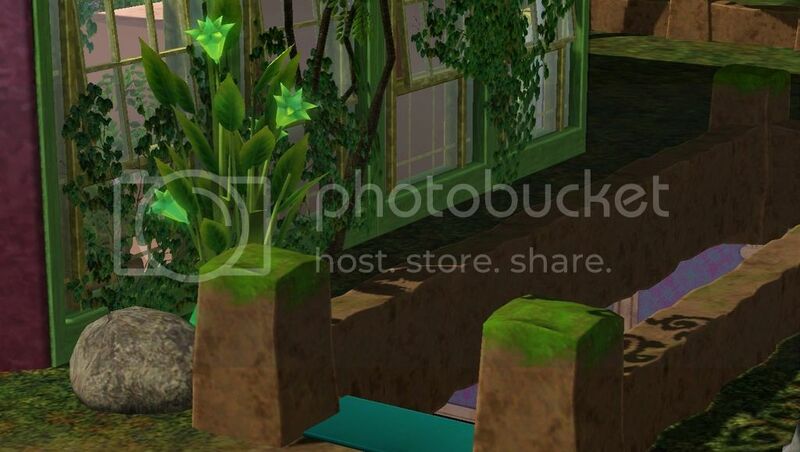 The greenery looks so effective on the walls! 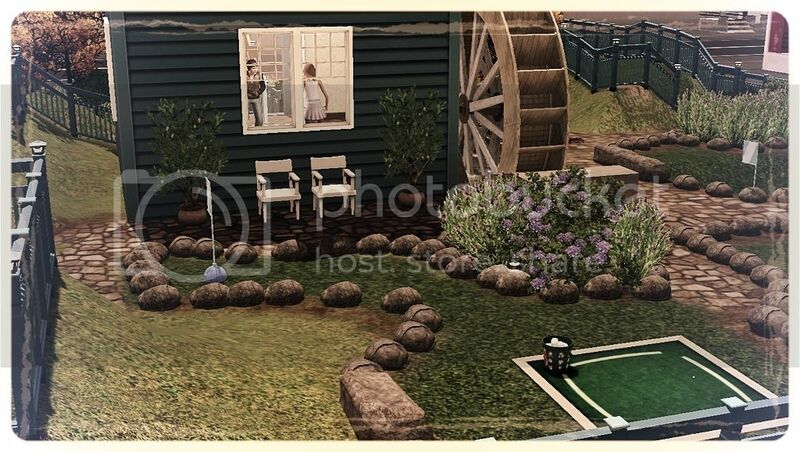 The nature themed look and natural feel throughout the home areas is so very nice! The greenhouse is very nice! 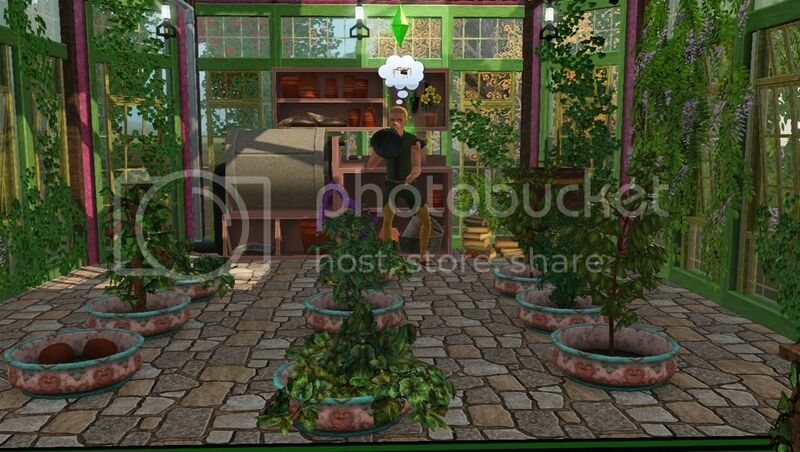 Sims will enjoy growing plants in the planters there. 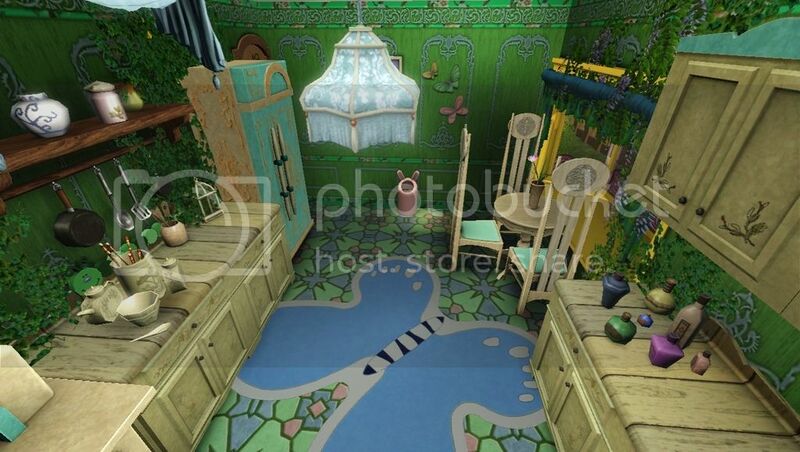 It is such a very nice home for fairies and all sims! I don't think a fairy home would be complete without it. It really livens up the place, so to speak. Thank you, Rose! I tried to put pastel colors on the inside and out, but was slightly concerned about the use of too many patterns. I think it turned out just right.